This abode of Shri Ranganathar is located in Palamalai Hills is near Periyanaickenpalayam on Mettupalayam Highway (Ooty Road) about 30 kms from Coimbatore. Of late, this place is in news for man-animal conflict particularly with the 'Rajahs' (elephants – that's how the locals address it) or 'Doddavar' (respectful reference to a family elder in Kannada). As everyone knows this is man made friction. We are encroaching and trespassing their territory and they have been left with no choice but to retaliate. Resultant, the hamlets on the fringes of Palamalai range are prone to elephant 'trespass' for food and water. Ironically,the man is fighting for his own survival. The view from Palamalai is breathtaking, a panoramic view of Coimbatore on the south-eastern side and on the other, unending folds of the Mother Nature. The hill/mountain range stretches upto Nilgiris on the northern side and on the western, it goes upto Anaikatty (Tamil Nadu) and thereon the range runs into the Kerala side of Manarkkad and the famous Silent Valley National Park. The terrain from the Palamalai side towards Kerala is almost inaccessible by foot and only seasoned trekkers and the tribals may give a go. The wildlife here is mainly Rajah (the elephants), wild gaur (cousin of bison), deer, leopards, occasional sighting of bear, wild dogs, wild cats, snakes, different variety of birds like Peacocks, owls, bald eagles, jungle fowls, etc. its an ideal location for bird sighting too. The biggest asset that can be saved for your childrens and your grand heredetary is visiting the holy places around the world. Those who born as human should visit the Palamalai atleast once to fulfill his desires in their life. I wish everyone to visit to the Palamalai hills and have the Darisanam of Arulmigu Aranganathar. As a heredetary trustee, onbehalf of the Palamalai Aranganathar Temple I welcome all the devotees. Thank You! Mr.U.Jagathesan, B.Sc., is the heredetary trustee of the Arulmigu Palamalai Aranganathar temple. His family heredetary peoples are the respected trustees of the temple. 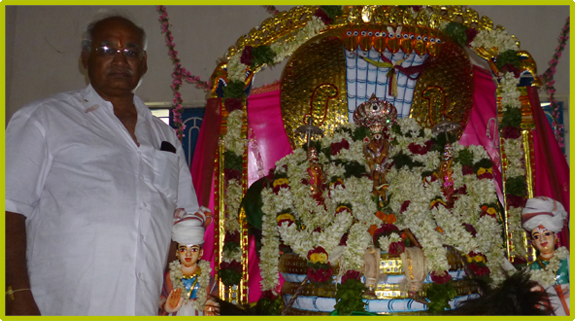 Mr.Jagadesan is the trustee who is taking care of all the resposibilities and activities in the temple. Apart from his family desires, he is spending a lot more effort to develop the welfare of the temple. He spends more time with the devotees and the staff members of the temple. Arulmigu Palamalai Aranganathar temple is well beingly maintanied by the heredetary trustees. Mr.U.Jagadesan is a successive trutee of his brother and his brother was the successive trustee of his father and his father was the successive trustee of his grand father. As like this, this heredetray trustees successively being a part of the Palamalai Aranganathar Temple.